"Keep in mind, this was undertaken purely to give individuals a venue to lodge their protest to the regulatory actions of the Administration - not because anyone thought anything tangible would result. There will be other such opportunities created. The Congressional outreach petition is tangible, real, and meaningful, as each office keeps track of the "yeahs and nays" on each issue or piece of legislation." - Glynn Loope, CRA Executive Director, re: the now failed White House petition. Wait... it was busy work? Mr. Loope then went on (this was in a Facebook comment thread) to lament the 'moving of goalpost.' You see, White House online petitions used to need 25k signatures in order to trigger an official response. Now, it is 100k. I asked Mr. Loope within said comment thread if this was known to be the case at the petition's onset. I have yet to receive a response. I just checked back and cannot seem to find the thread any longer. I will update here if anything warrants my doing so, and if I recall to do so. Foyle Classic Cigar Sampler at Cigars City. Whom I too thank for this offering. An artist's palette of milk chocolate colorings with a fairly high-up goldenrod under-hue brought up even further by the similarly colored band. Some tooth, more in the 1/3 and 3/3 than betwixt 'em. Tooth lends to a more dry hand-feel than the eye would suggest off a decent oil sheen. Seams are tight and even. Triple cap is affixed nicely. Veins are present but not nigh egregiously so insofar as burn, at least. To the eye, the many smaller spiderweb veins are something of an impediment. Foot tobacco peeks out at a medium to medium+ density, as it is a tick unevenly distributed. Mainly auburn with low-lights of brunette. More on hand-feel... according to a Charmin Squeeze testing, there is a softer spot in the 2/3, but all is a variance on a medium density. Heft is nice, balance seems to lilt a bit toward the cap. Feels a good deal toothier than it looks. Schnoz notes along the shaft are a sweet leather hay with a vibing of white pepper. Some sweet spices and a dash of vanilla are stirred in at the foot. I Xikar Xi2 the cap and a cold pull is of a medium tension and maybe wandering toward airy. Cold notes are quite creamy and of hay and caramel in the forefront. Backing that up is a sweet yet non-descript spice and a pepper thing. I'd say the cold underbelly is leather. I take some more tugs, a couple/few, trying to nail the spices and pepper. I can't. But the draw does pick up some more tension and a very earthen tobacco note. Nice 'nuff cold. Let's burn, gentlepersons. Toasting the foot gives off an aroma of wood shavings on leather. Some slight nuttiness. Process is sans hiccup and smoke out-put off both ends is immediate and voluptuous. First hot draw, it smacks me: allspice. That's what was confusing my cold draws. I couldn't place it till now. Some vanilla and caramel are on-board. A tobacco front and leathery hay underbelly. Dirt fills out the middlings. Creaminess appears on the second hottie, which is retro-haled. White coarse-ground pepper is there, followed by a finer-ground black. Both play softly well in the cream. A third pull shows a tick more spice rack, but it doesn't delineate as of yet. Almond extract appears suddenly with a sugar attachment. Too, there's a cedar addition to the cream. Very earth driven, but not simply so... not with allspice and fancy almond extract. There's a floral attachment to the caramel now. Blister at the char never materializes and the line straightens on its lonesome. Ash is an ugly bit of grey with a jagged side, but holds on at 3/4". There's alfalfa grass afoot in the under-belly with a now very nice leather and earth complexity. The earth bit has drawn in the tobacco stuffs of yore. Packing has softened some, but seams hold. Draw continues to see its resistance fluctuate within the medium mark. I roll an inch of ash off into my $0.99 Walmart tray. It's dry and coarse. The ash, not the tray, gentlepersons. Profile and strength hold to medium. Smoke out-put begins to waver along with draw tension. Mouth-feel is perfectly moist but a bit gruff. Primary notes are cream and cedar with a fluctuating car-a-mel. High-up middlings are allspice and white pepper. Then comes soft black pepper (on retro-hale), and that neat-o almond extract with sugar accompaniment. Lower, there's an alfalfa vibe. Middlings are a bit cakey in a dense fashion. Under-belly is tobacco earthiness under a drying leather. Floral stuffs swirl in and out. Throat is a tick sharp and a peppery mouth tingle is introduced. Strength ups a second, comes back down. Ups another second. Down. Flavor notes have hit a lock-step stride. Combustion has, as well. Construction softens a bit more a half inch off from burn. Still seams hold and construction is OK, all told. The draw is moving around less re: tension. Now the caramel note gets some apple. Applesauce. Cinnamon distinguishes itself from spice rack and sprinkles there. A refined bit of 'flavor bomb' happens, as all remain on-board and their heights doth soar. All kinda lifts up. Neat. The band is of an unfinished texture, not my favorite approach, but germane to this Foyle offering. Mouth-feel errs toward dry. Pack is firming a noticeable bit. Retro-hale peppers up and waters my sensitive and intelligent green eyes. Room-note is a dry bit of gruff pepper with an under-belly of driving sweetness. Leathery throughout. Combustion has slowed and the line is quite even on only the slightest of ribbon. Ash is of the same complexion as prior, and is now a loose sheath cracking into an occasional airy ladder-rung. Creaminess has dialed back some on the body, but has heightened insofar as flavor. Toasts. Cream re-mounts and soars; in its wake is the sweetnesses. 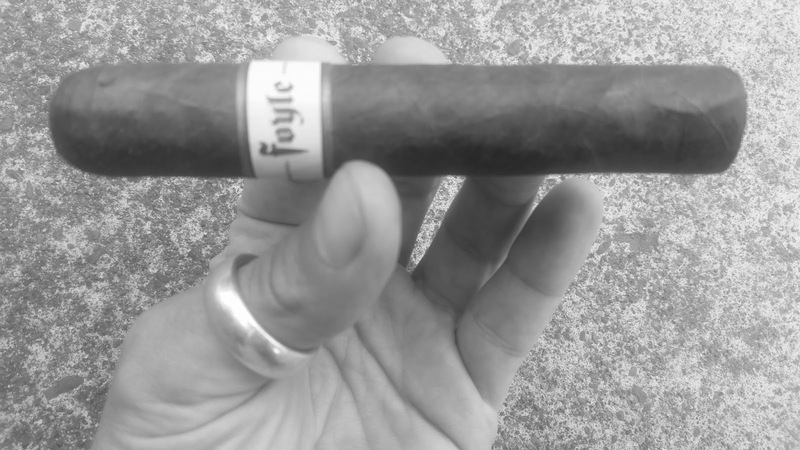 In their wake, a very cool aromatic tobacco that lingers on the palate and lengthens the finish quite a bit. Draw tension is now a medium+. Room-note is pillowy. Smoke ramps up off both ends. Sweet cream hides some of the slighter notes in particular the allspice, but all remain. Floral aspect flows more than ebbs at this point. Body is a yellow cake from a Betty Crocker box. It's on the draw, too -- high middling and tickling at primary. With an inch and a half remaining, the nub softens to a great chew. Its smoke is non-irritating to me eyes and throat. A decadent treat for those looking for that and beyond the typical death by chocolate it usually brings. Some pale fruits are in the creamy dessert. Dessert has two S's because ya always wants seconds of dessert. I too, could go for another Foyle Classic. Foyle rhymes with Mohel. I do not wish a second one 'a those. Profile ends at a boundary-pushing and robust medium. Strength is a kindly match to that. Burn never loses its ribbon, but no re-touching is necessitated. Nub could be considered spongy, but again germane to plot. The shoulder does come loose a tad. Smoke is cool and thick in my currently sans tingle smoke-hole. My schmatta was busy throughout, skillfully whisking ashes away. So it is agreed, then? This Foyle Classic is the indoor girlfriend of the cigar offering world. Not looking to be a world-beater -- which is well and good. Seeing as the world beats world-beaters. Loganberry or Concord Grape Manischewitz. Coffee with copious amounts of cream and sugar. Hot cocoa for the kid in ya. White chocolate hot cocoa for the pretentious kid in ya. Listen to an audio version of this review HERE.